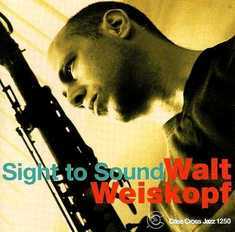 Walt Weiskopf's eighth recording for Criss Cross introduces Side to Sound, his ten-part suite for jazz sextet. A celebration of the relationship between various art forms, the suite was inspired by the graphic art of modern masters ranging from Dali, to Picasso, to van Gogh. Weiskopf utilizes elements of jazz and classical music, skillfully integrating improvisation and written themes. Sight to Sound is brought to life by Weiskopf and his longtime associates alto saxophonist Andy Fusco, trombonist John Mosca, pianist Joel Weiskopf, bassist Doug Weiss, and drummer Billy Drummond.